Courage: A Story of Love and Friendship tells the story of Jenny and Daniel. These two different souls with similar dilemmas, find their way to each other to create a special bond that is their greatest joy and pain. After being apart for years, both are living different lives but have the chance to be together again. Written by Disko Praphanchith, the story is about the human heart and the courage to love and seek happiness. 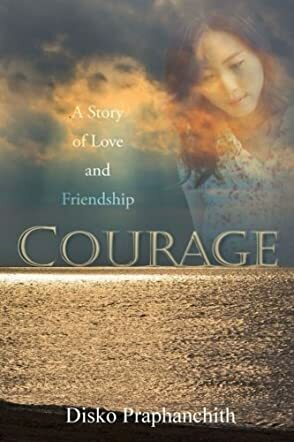 Courage: A Story of Love and Friendship is a poignant novel with beautiful depth. Disko Praphanchith has written a story that is literary and exceptional; the narrative flows effortlessly. The violent scenes are hard to read, but the characters’ moments of joy are very much welcomed. The story is not just a simple romance tale, but also profoundly touches on one’s individualism in society. The romance between Jenny Park and Daniel Fischer is touching and multi-layered, with many issues that are real for readers to connect with. Disko Praphanchith’s expertise in philosophy and literary writing shines through the many integrated subjects that emerge in the relationship between the two main characters. In my opinion, this quality is the main strength of the novel. Ironically, the minor downside of this novel, as the result of that quality, is the length of the novel. Five hundred pages is definitely a long read, and this is due to the number of philosophies that Praphanchith included. However, they are enlightening and without a doubt worth the read. In other words, a solid novel for everyone.